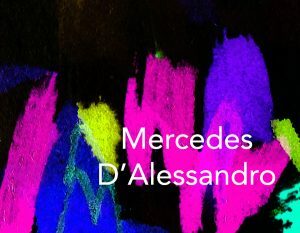 Mercedes D’Alessandro, a young and innovative economist, writes and thinks of women’s work from a new point of view which has given rise to great interest and discussions in feminist circles. Feminism is not something new, it has always existed. The idea that a woman should have the same rights as a man is an established cultural fact. So what is special about being a feminist in the period of history in which we are living? One great difference is the role in the economic system that we women play today. In the 1960s only two women out of ten worked outside the house, today seven out of ten do so. This has completely transformed economic and social relations. On the whole, women now have greater autonomy because they have a profession and have incomes of their own at their disposal. In the United States women account for 50 per cent of the work force and in Argentina for more than 40 per cent. However all this has been and is obtained at the price of a double day of work: women, in most cases, continue to do the housework work and to take care of the family. These tasks demand a great deal of time (an average of six hours a day) and become an obstacle for those who cannot afford a domestic collaborator or who do not have access to a nursery school for their children. Many women must be employed for fewer hours if they are to manage to do everything or they must work very hard, never resting, which undermines their health and their personal growth. Today women are feminists with this double identity of being women with greater possibilities, yet at the same time still culturally confined to a domestic role and thus exposed to greater exploitation. Furthermore on average we earn less than our male peers and do not manage to achieve managerial positions. In short, capitalism has a hidden partner: the woman who does unpaid domestic work. And if things were to change, the market would suffer the consequences. In the 1970s (as a result of the social struggles of 1968), radical feminism held that the personal was political and that relations between men and women were power relations. Do you believe that this still holds true? When we speak of unpaid domestic work as a social problem it is precisely this. For some might say that women choose to stay at home and bring up children instead of having a career. But these decisions are made in the context of a society in which, for example, mothers have three months of maternity leave whereas fathers have two days (at least in Argentina). The father can have all the desire he likes to look after his child but has no possibility of doing so. Furthermore a mother who abandons her place in the family in order to work is criticized, whereas a father who “sacrifices” himself for his family and is out of the house all day is congratulated. To what point, therefore, are personal decisions private? “The personal is political” is a motto which is still applicable and which also refers to male violence and to certain ways of facing these problems in order to seek global solutions. Is there a change of guard between the militant women veterans of the 1970s and 80s with a very combative yet perhaps somewhat sectarian outlook and the young women of today? Is there a central thread uniting the old feminism and that of our day? And what is contemporary feminism based on and how does it differ from that of the past? I believe that every wave of feminism had very constructive characteristics and internal debates. I did not experience those of the past which I know solely through the testimonies in books and accounts. In all respects I think that these characteristics and debates must have been no less exciting than those of today. Today there are so many groups and ideas and feminism is very different but by contrast the patriarchy has not changed much. When we read about the reasons given for why women were unable to vote, they still sound contemporary…. In any case I believe that the challenge, not only of feminism but also of our generation, is to find a possible alternative for the world in which we live. We live in an unequal society, and this inequality increases in relation to gender and to the colour of the skin. Poor women, migrants and black women are those who suffer the effects of inequality the most. Our economic system sets us against nature. Thus there are so many things to dismantle. In this sense feminism has much to offer. It was in the news recently that the senior BBC editor Carrie Gracie resigned from her post because of the persistent pay discrimination between men and women in the British Broadcasting Corporation. Is there a systemic discrimination against women in the world? How can the salary gap and the precariousness of work be the bread and butter of millions of women across the world? By bearing a greater burden in unpaid domestic work and family care, women have less time to do an official job. Thus they take precarious jobs which are the worst paid. Hence they have fewer opportunities for development in their career, profession or employment which makes them poorer. Poverty is sexist. Precarious work is the bread and butter of millions of women. Of course, not even men escape an increasingly difficult labour market which can only get worse as the pace of technological changes and automation increases. The difference in men’s and women’s salaries is the symptom of a profound sickness of the system which must be attacked at its roots. According to the data that emerged at the World Economic Forum in 2017 the difference in the man-woman relationship is not only not diminishing but is even increasing. In addition, these data indicate that the path has been inverted in a negative sense. Their interpretation shows us a world in which, for example, a country such as Germany, the driving force of the European Union, has the third largest salary gap in Europe. In your opinion, what should be done to reverse the situation? The data of the World Economic Forum, and of the International Labour Organization too, show that the gaps are not being closed. For years in all the world forums we have heard talk of women’s emancipation but when we try to see what has been done in this regard the picture is sad indeed, even as regards the most elementary questions. The UN speaks fine words but in all its history it has never had a woman Secretary General. The Nordic countries are generally beacons in this field, and their public policies in the context of support to families have given excellent results, for example, in prolonged maternity and paternity leave, shared and obligatory for both parents. However, much still remains to be done. From the viewpoint of the science of economics, how do you explain the fact that the market aims to put women in second place in the labour system? I do not know whether the market, understood as an abstract entity, is aiming at something. What happens, yes, is – as Heather Bushey says – that capitalism has a hidden partner: the woman who does unpaid domestic work. There are millions of hours of unpaid work that are done in silence and are vital to sustain all the other forms of work. Without this woman who washes, irons, tidies up, does the shopping, oversees the children’s homework, takes them to school or to the gym, sweeps the floor and cooks, it would be hard to carry ahead all the other activities. This idea has remained stuck to women, as if it were part of their nature or as if it were a responsibility of theirs. In a world in which women work eight hours a day, this is not only unjust but is also penalizing. What I mean to say is that it is convenient to the market to have multitasking, unpaid women working in their homes. Can you tell us what “Economía Feminista” [Feminist economics] is? What does it consist of? When did you decide to launch yourself into this adventure and what were your motives? Economía Feminista is a website born as a place where women economists can reflect on topics that are not on the agenda of either the media or our economist colleagues. It was born from the cry of “Ni Una Menos” [not one less], which conferred on it a more than important place in the broadest debate linked to all the inequalities which we women experience and which range from male chauvinist violence to economic violence, passing through the stereotypes that are imposed on us and limit us. The website, and especially the debate on the social networks, showed me, at a personal level, that there were very many unanswered questions and inspired me to write my book Economia feminista. I wanted it to be, like the website, a space that offered ideas and discussions, and above all I wanted it to be educational. I wanted those who read it to be able to learn something new; however, not as an anecdote but rather as something that would provide them with the means to transform this unequal and patriarchal world. Two years after the opening of this website and the publication of my book I can say, with great pride and pleasure, that we have contributed much to the debate and at the same time we ourselves have been incredibly enriched through the continuous relationship with our readers. It is the place in which I am interested in bringing my personal academic training to fruition. I really hope that it will be able to overcome the forms and barriers of universities and forge instruments, so that it may contribute directly to the popular expressions of feminism. An Argentinian with a degree in economics, a lecturer at various universities and a popularizer of economics, Mercedes D’Alessandro is one of the feminist economists who have awakened much interest in recent years. In 2015 she launched the portal “Economía Feminista”. The web page, which makes use of the work of not only a group of economists but also of experts in other disciplines, has succeeded in introducing economics with a gender prospective into the Latin American public agenda and in winning over the social networks. 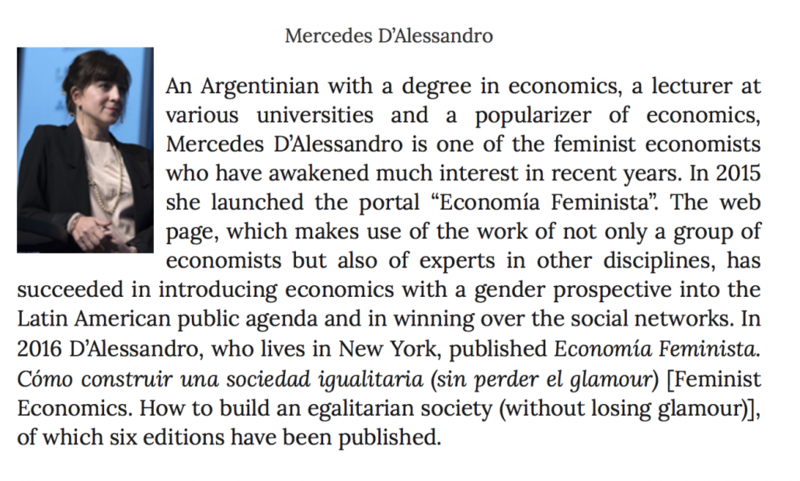 In 2016 D’Alessandro, who lives in New York, published Economía Feminista. Cómo construir una sociedad igualitaria (sin perder el glamour) [Feminist Economics. How to build an egalitarian society (without losing glamour)], of which six editions have been published.